OK, so as most of you obviously already know (as you live on planet Earth) it was Halloween on Friday and that means that not only did you spend most of last night feeling sick, but your social media feeds were also filled with companies making tenuous links between their product/company and the Eve of All Hallows. Well mine were at any rate. Now, as I am married to a marketer (for my sins) I obviously know how important it is to use key calendar dates to help fill up your blogging calendar – hell, I’ve even written blogs about how important this is – but when I sat down yesterday morning to have a look at the efforts of my fellow marketers and try to think of something inspirational to blog about, I was attacked by a great big scary Halloweeny monstery thingy, who drained me of all motivation. It wasn’t as if everything that I saw was bad – some of it was good – but most of it was tenuous at best. So, instead of something inspirational, I present you with this. Lucky you. Yes, fair enough, some companies can quite easily link their products or services to Halloween (for some it’s even their raison d’être) but for others it’s hard – SEO being possibly one of the least Halloweeny things I can think of – and so racking your brains to come up with a link can sometimes be difficult and you end up with a link that is often somewhat tortured. Appropriately. I know that some of you will be thinking that SEO is actually quite a scary topic in itself and I did toy with writing a rather predictable blog post about that but, never one to follow the crowd, I balked. So this year I am simply going to give you a roundup of the best and worst posts that graced my Twitter and Facebook feeds yesterday. The second most common theme that I saw in yesterdays’ feeds was the good old pun. Now I love a good pun but I think I can fairly safely say that most of yesterday’s elicited more of a groan than an uncontrollable belly laugh. The problem is, of course, that some of the SEO jargon lends itself to a Halloween play on words, so quite a few people took advantage of this whilst they had the chance. The majority of the punners went for a variation on the theme of keeping the spiders at bay but the best article of these came in the form of Search Engine Watch’s [@sewatch] “Halloween Inspired SEO Tricks To Keep Spiders At Bay“, although I did also like the tweet from Leverable [@leverable] – “Fear not…Don’t be afraid of creeps”. As I have already mentioned, the obvious post to link the disparate worlds of Halloween and SEO is the ‘isn’t SEO scary?’ blog and there was no shortage of bloggers yesterday lining up to fulfil this requirement. Two of the better offerings that are worth a read are Titan Web Marketing’s ‏[@TitanWMS] “Start #Halloween off right with these Frightening #SEO Tactics That People Still Use! (Sic)” and The Media Flow’s [@theMediaFlow] “Technical #SEO nightmares”. Similarly, Jamie Joopa ‏[@JamieJoopa] took the opportunity to encourage better content marketing with his succinct Tweet “The scariest thing I’m seeing this #Halloween is bad content marketing. Brand Managers: Don’t spook VCs with poor SEO. Think viral/local (sic)”. Well said! Like me, a few sites decided that the best way to tackle the Halloween dilemma was to take an analytical approach and kill two birds with one stone; hence there were quite a few blog posts offering a roundup of the Halloweeny goodness available. One such was Search Engine Land [@sengineland], who gave us a roundup of all 6 of Google’s Halloween Gifs, thereby proving that the Doodle team must have been feeling particularly indecisive in the run up to this year’s Halloween. Similarly, Koozai [‏@Koozai] treated us to their “Shocking Digital Campaigns From Across The Web” combining the good, the bad and the ugly and giving us a rather interesting article to boot. 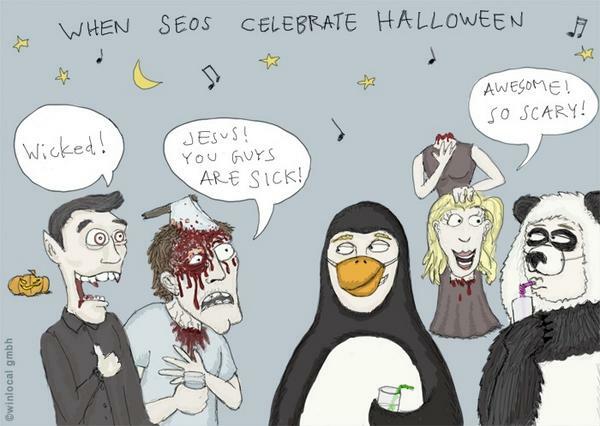 This was a great one; Marcus Tandler ‏[@mediadonis] brought this to my attention as a “Great Halloween SEO Content Marketing piece” and he was right. Yes, I know it’s talking about the ‘SEO is scary’ angle again but the themed graphics and out-of-the-ordinary design, together with the appropriate content and style of writing, mean that it lifts it above the usual run-of-the-mill, tenuously linked posts and makes it a little bit special. As everyone who knows me knows, I LOVE a good infographic and this Halloween I was hoping for one or two corkers. I did get one Tweet that looked promising in the morning but the link wouldn’t work so I was a little bit depressed for 5 minutes. Fortunately, it was closely followed by this one from Wordtracker [‏@wordtracker]; “Here’s a scary SEO infographic to get you in the mood for #halloween (sic)”, which delivered on all fronts, despite the tenuous link (in fact, this one could have gone in the previous section)! Unfortunately, that’s the only one I got in my Twitter feed on Friday and more may yet come in, but if you saw any other infographics then please do let me know. Whilst I’m well aware of the old adage that there are lies, damned lies and statistics, I still love a good statistic. Not as much as an infographic I’ll grant you, but you can’t deny they are useful (hey, I’m a copywriter, I’ve got to have something to bolster my wild accusations!). My statistics fix on Friday came from Forbes [@Forbes], who told me that “33% of Americans are going to throw or attend a Halloween party”. OK, that’s not that scary a fact, I’ll own, but as a 30-something English female, raised on a litany of American films and TV programs who seemed to treat Halloween as the most important holiday (Hocus Pocus and endless Simpsons Halloween Specials spring to mind), I was quite surprised at how low that figure actually was. There’s actually very little else that I received that was worthy of including here, as there wasn’t anything that really blew my socks off. The rest of my social media feeds were filled with the usual corny tag lines and cheesy Halloween puns (nothing wrong with that), some tenuous and some better, plus my Facebook feed was obviously filled with photos of my family and friends looking frightening. And then they put their Halloween makeup on (boom boom)! For sheer simplicity and audacity however, my ‘Favourite Tweet of the Rest’ Award goes to Olive Street Design ‏[@OliveStDesign], who informed us that “Halloween is upon us, and We are prepared with spooky quick web design and terrifyingly high SEO results! (sic)”. Fair dos guys! If you saw anything that was better, or if you saw anything that was truly awful (particularly if it was so bad it was good) then please do let me know; I’m a little bit disappointed with this year’s offerings so would love to know if I’m just missing out! You can get in touch with me in all the usual ways; the two best are to either email me at rw@growtraffic.co.uk or leave me a comment below. Thanks for reading and I look forward to hearing from you.